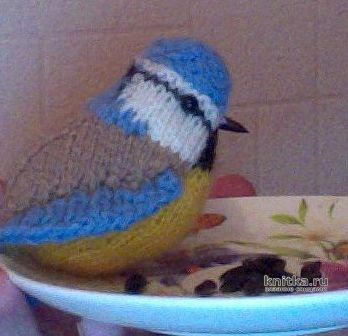 Love to knit birds knitting. These are made of acrylic. 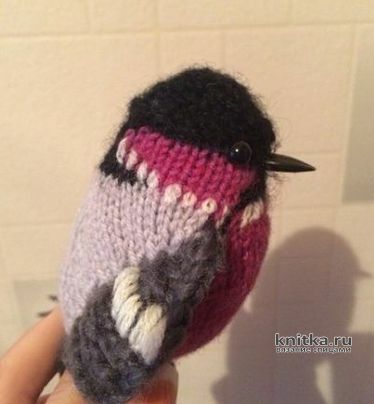 Tried knitting from iris, more realistic work. 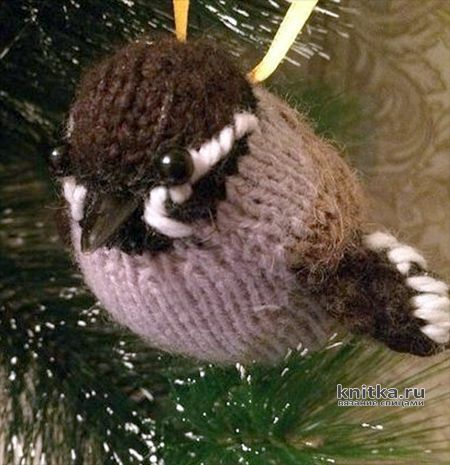 It is based on the description of birds - titmouse. — where it says — turn in the middle of the row, perform this turn, wrapping the loop to avoid holes. — ѕ2кро — remove the two front loops, the next loop to purl, to shoot her two previous loops (decrease 2 loops). M1 — add a loop of pulling. Two knitting needles and yarn And get 2 loops. S range: 1 L. p.. (M1, 1 l.) twice, 5 loops. Continue to knit with yarn B. 4 rows and purl rows: Phi. 9 row: 9, L. p., turn, 7 Phi.p. turning, L. p. 6, turn, 5 Phi.p. rotate the front to the end of the row. 11 range: 1 L. p. 2 L. p. together 5 L. p. 2 L. p., together with the slope to the left, L. p. 1 — 9 p.
13 range: 1 L. p. 2 L. p. together, ѕ2кро, L. p. 2 together with a slope to the left, L. p. 1 — 5 p.
Row 15: with the front side, starting from the stacked series, the first needle and yarn And lift up from the ends of the rows, knit in yarn A, and provarite h l p. and 9 p. from the ends of the rows, knit in yarn B. a Second needle knit across the row (2 L. p. together, 1 L. p. 2 L. p., together with the slope to the left) 5 loops 14 of the series, the third needle pick up and knit 9 loops from the ends of the rows, knit the yarn In and 3 loops from the ends of the rows, knit in yarn A. 27 loops. Now turn and knit the rows with 4 spokes. 1 range (IP): Phi. trim A. Z range: remove the first 2 loops on the thread from the remnants of yarn. Attach and purl the next 9 loops, yarn — 5 Phi.p. yarn A — 9 Phi.p. remove the last 2 loops on the thread from the remnants of yarn (use separate balls of yarn). 9 range: Phi. : A — 6, C — 13, A — 6. To cut and continue yarn D.
11th row and purl rows: Phi. 18 row: (L. p. 2 together) twice, 5 L. p., M1, 7 L. p., M1, 5 L. p., (L. p. 2 together with a slope to the left) twice, 23 loops. Continue with subtraction and addition on RS in the same spirit. Subtract 1 loop. In 26 you will have 15 loops. 28 row: (L. p. 2 together) twice, M1, 7 l p., M1, (2 L. p., together with the slope to the left) twice, 13 petal. 30 row: (L. p. 2 together) twice, 5 L. p., (2 l. p together with the slope to the left) twice, 9 loops. 32 range: 2 L. p. together 5 L. p. 2 L. p., together with the slope to the left, 7 loops. Cut D and continue with yarn B. *1 row knit into a coach. 1 row (BOS): 2 years p.. (1. p., 1 l.) twice, 1 L. p.
2 range: 1 L. p., (P1.p. L. p. 1) 3 times. Repeat these two rows 3 times, then knit across the row again 1 row. To close the loop from the front side. From the front side to place the remaining 4 hinges from the head on the needle, join yarn C.
2 rows and purl rows: Phi. Trim and continue With yarn E.
Starting with Phi. row, purl 3 rows front surface. 17 range: front to last 2 loops, turn, purl to last 2 loops, turn, face to the last 3 loops, turn, purl to last 3 loops, turn, front to end of row. Cut E and continue with yarn B. On the front side yarn D from the first subtraction on the left side to pick up and knit 19 loops. Knit across the row row 1: Phi. 2 range (HP): 2 LP, (P1.p. 1 LP) 7 times, rotate, drawing the gum 13 of the hinges to rotate, drawing the gum 11 of the hinges, rotate, drawing the elastic loops 9, turn, knit elastic band to end of row. To associate in the same way the second wing. Yarn With, to gain 5 loops. Bind 1 number thus: 1 L. p., ѕ2кро, 1 L. p.
Tighten thread the remaining 3 loops. On the reverse side of the head, secure the ends of the threads. On the front side to connect the ends of the rows associated With yarn, with the ends of the series connected by the yarn And remove the yarn And with a mosaic of the region. Stuff the head, sew the beak to the stacked row, which is pre-join to make a circle. Sew back and front pieces on the sides, gradually filling the torso. Sew beads-eyes. Cut the wire length of about 45 cm and bend with pliers. Yarn, E wrap legs, yarn — claws.